As the largest private sector employer in the United States, Walmart has enormous power to set the trends not just for the retail and service industries, but for the economy as a whole. Wages and working conditions set at Walmart have a ripple-effect throughout all jobs: low wages, limited access to health care, and no retirement security. Currently, Walmart’s goal to expand their profits is leading them into key urban areas across the country. Walmart is campaigning to win support from important community leaders, faith leaders, and public officials that will help them expand into new urban markets. 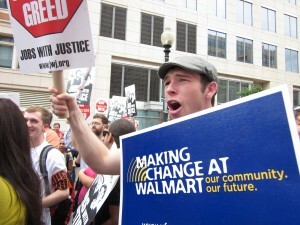 Walmart’s efforts include media, community, and political maneuvers to position themselves as a good corporate citizen and jobs creator, when in fact the company has a record of not creating good jobs, not paying their fair share of taxes, and having the effect of forcing small businesses in their orbit to close down. In cities where Walmart is looking to expand, SLAP chapters and Jobs with Justice coalitions are working to ensure that Walmart has a positive impact in our communities. For example, some local coalitions are working to get Walmart to sign community benefit agreements that ensure good jobs, and to ensure that their stores do not negatively impact local communities. SLAP chapters and Jobs with Justice coalitions are working with the Organization for Respect at Walmart (OUR Walmart) to build a voice for Walmart associates. What we’re demanding from Walmart is what we’re demanding overall: creation of good jobs, the right to organize and collectively bargain, and the right for dignity and self determination for our families and the communities we live in. Communities should decide is Walmart should build in their neighborhoods based on whether or not Walmart meets their standards on these questions. Some say that Walmart cannot be organized. But many said the same about auto workers at Ford before 1935 or about janitors before 1985. Both victories not only changed the lives of the workers involved, but they raised the floor for working people and our communities across the country. They changed the entire economy for the better by creating sustainable, union jobs and dignity for our communities. 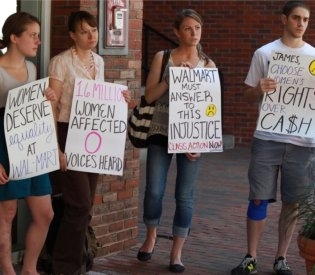 If we can change Walmart, we can improve the lives of all working people. This entry was posted on Monday, January 23rd, 2012 at 5:16 pm. It is filed under Issues. You can follow any responses to this entry through the RSS 2.0 feed.